Senate Democrats complained that the Bush administration has refused their requests for more information about John R. Bolton, the president's nominee for U.S. ambassador to the United Nations. The Senate Foreign Relations Committee postponed a hearing, scheduled Thursday, to consider the Bolton nomination because several panel members were attending Pope John Paul II's funeral, a committee spokesman said. The hearing was rescheduled for Monday. In a letter signed Wednesday and described to The Associated Press, all the Democrats on the committee asked Chairman Richard Lugar, an Indiana Republican, to wait to reschedule the hearing until they receive background material they say they need before Bolton comes before the committee. Democrats said the administration also spurned their requests for some witnesses to appear before the committee. White House spokesman David Almacy said Wednesday night, "We have made both individuals and documents available and we will continue to work with them." Democratic officials, who spoke on the condition of anonymity, would provide no details on what records Democrats wanted to see and people they wanted to interview. A senior Democratic Senate aide said that Democrats have been trying for two weeks to obtain a small number of documents and interview a few people from the State Department and CIA as they prepared for the hearing. The aide said the administration has not cooperated. "Those requests have been rebuffed," the aide said, "and we've been given no compelling reason why." Norm Kurz, a spokesman for Sen. Joe Biden of Delaware, the lead Democrat on the panel, said, "It's important for the executive branch to cooperate with the senators who are seeking to do their jobs." Democrats are researching Bolton's background in preparation for at least one day of tough questioning. 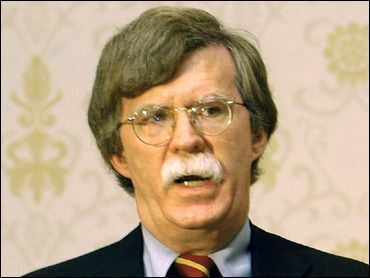 Senate Democrats have circulated a portion of a two-year-old Senate Intelligence Committee report questioning whether Bolton pressured a State Department intelligence analyst who tried to tone down language in a Bolton speech about Cuba's biological weapons capabilities. The committee's spokesman, Andy Fisher, said the postponement involved an agreement with Democrats that committee action on Bolton would be completed next week. The postponement came as the vote of a pivotal Republican seemed uncertain. Bolton faces opposition for stands he has taken as undersecretary of state for arms control and for his outspoken criticism of the United Nations. His chances of approval could hinge on the vote of moderate Republican Sen. Lincoln Chafee of Rhode Island. If Democrats are united against confirmation and Chafee joins them, Bolton's chances of going to the United Nations could be damaged. "The senator has not made up his mind," Chafee spokesman Stephen Hourahan said Wednesday. "He's waiting to hear on the record what is said and then he'll decide. But we're inclined to support the nomination. That's where we are." Republicans hold a 10-8 edge in the committee. Bills and nominations need a majority vote for a committee to send them to the full Senate, although the committee can reconsider a failed vote later. Senate aides say, at this point, all Democrats on the committee are likely to vote against Bolton. President Bush's nomination of Bolton, a blunt-speaking hard-liner, has stirred unusual controversy among diplomats. Five former secretaries of state urged the Senate on Tuesday to confirm Bolton. Scores of retired diplomats have lined up on both sides.